Enjoy the natural beauty of the outdoors with an elegant glass lanai enclosure. You’ll enjoy year-round comfort while being sheltered from pests and inclement weather. 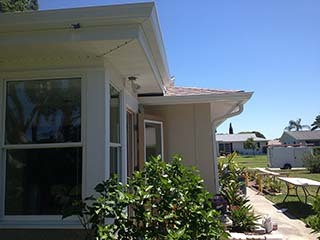 We can enclose your lanai in glass, screen or premium vinyl windows. Vinyl windows offer many benefits and are a more economical way to enjoy your surroundings. 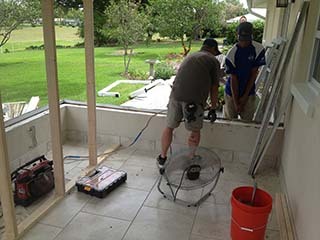 Converting a screened porch into an enclosed space is known as "converting your lanai." Conversions are classified by two types. The first type is to remove your old screen system and install windows. And the second type is to get engineered drawings and essentially redesign this part of your home with the proper insulation, electric, heating and cooling, concrete work, etc., according to local building codes. 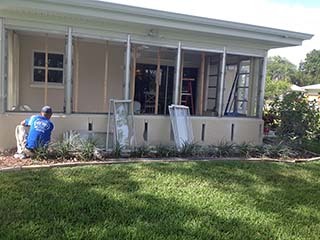 When replacing just the screen with lanai windows, you will keep dust, dirt, and water out, and essentially add a very nice look to your home. However, unlike the second type of conversion, the first type does not afford much in the way of insulation and storm protection. The second type, while more expensive, is generally the only way to go in that not only are you afforded the new look, but you have actually added real value and living space to your home. All while ensuring that the additional space will be very cost-efficient in terms of energy savings. 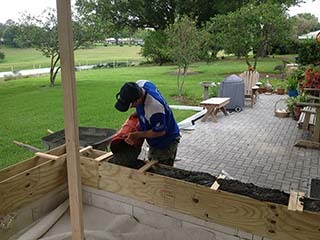 The photos below outline the basic steps followed to properly convert a back porch, and/or screen enclosure to a lanai. Please note that not all conversions will begin this way and some conversions may require more prep work to ensure all local building codes are met. 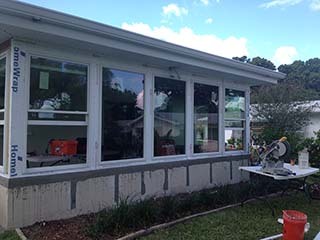 We are providing these photos here only as a way to show you a lanai conversion illustrating in a very brief manner how the transformation takes place. Removing the original jealousy style windows from old back room. We have fashioned a temporary wood frame within the enclosure to support the existing roof while the old windows are removed. Old window frame being removed in order to build a footer frame needed to increase the height of the window sill. Footer frame in place and pouring concrete into new footer. New windows installed and new stucco added to blend original facade. Trim being added and paint preparation started.